The best thing about any good fashion documentary is the fact that you can watch it while dressed in sweatpants and a towel turban. Sometimes there is no greater thrill than watching Karl Lagerfeld casually dismiss entire swaths of the population while I'm wearing tube socks bought at clearance from TJ Maxx. Now who's punk-rock, fashion world? Most of us only know about fashion from what we've seen on reality TV competitions and Meryl Streep comedies, so documentaries like The September Issue, Valentino: The Last Emperor, or Unzipped provide thrilling glimpses into alien territory. We don't necessarily need a thorough knowledge of fashion to enjoy them — we need only be able to enjoy the absurdities of art and wealth. 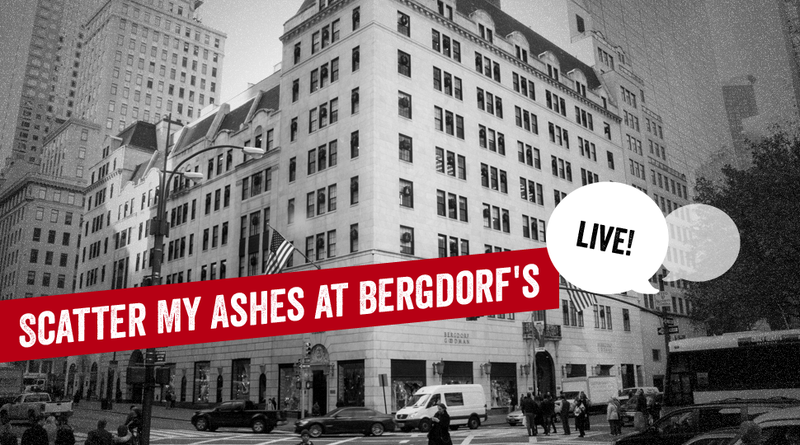 Scatter My Ashes at Bergdorf's is one of the newer entries in this tradition of fascinating docs. While a century-spanning look into New York City's shmanciest department store may not seem like an expansive, authoritative portrayal of fashion as a whole, the film makes a case for just how inextricably linked Bergdorf Goodman has been to the fashion world. From its deep ties to Hollywood, the European design scene, politicians, and even its famed hallucinatory holiday window displays, it's likely that this department store has had a greater influence on New York culture (and by extension, world culture) than most people realized. Now it's the subject of a documentary, which also happens to feature a famous set of twins who used to be on a show about a house that was full. Important. But while this film felt informative and immersive enough, it's likely much too hagiographical to be taken seriously as a historical document. Bergdorf's — with all its highly amusing talking head commentary from Joan Rivers, Susan Lucci, and countless other entertainers and eccentrics, plays more like an oral history by perpetual insiders that may not prove all that illuminating for ardent fashion fanatics. So where did you personally fall on that enjoyment spectrum? Let's talk about this thing! 1. So many former reality TV stars. Ever since the advent of Project Runway and Tyra Banks and whatever bogus fashion lines the Real Housewives are constantly starting, TV's representation of the fashion world has never really felt particularly genuine. Like, high fashion wouldn't have anything to do with exposure that coarse, right? Yet here we were, confronted by the reality that the Nicole Richie, the Olsen twins, Ally Hilfiger, and other former low-pop-culture fixtures are now reputable movers and shakers in this industry. Good for them, or R.I.P. fashion? 2. Designers, Old and New. Obviously anything featuring interviews with Michael Kors, Joan Rivers, or Karl Lagerfeld will be a hoot; those people are undisputed authorities in the New York glamour space. But what about that montage of young designers whose work had been rejected by Bergdorf Goodman? The unvarnished pathos of these designers' frustration must have been one of the more anxiety-inducing sequences in the film. Is it problematic to celebrate an institution that has dashed the dreams of so many? 3. Bergdorf Goodman Fashion Director Linda Fargo's anecdote about being mistaken for Anna Wintour: Charming story or major shade? 4. So Bergdorf Goodman prides itself on being able to raise its prices during economic recessions, yet Bernie Madoff's arrest destroyed its sales overnight? Sounds like a slippery business model. 5. In order to skirt zoning laws, Andrew Bergman and his wife had to list themselves as janitors in order to live in the penthouse of the Bergdorf Goodman store. Do you ever get the impression that sometimes rich people can do whatever they want? Be honest. What else occurred to you while watching Scatter My Ashes at Bergdorf's? Let's do this! This post is a sponsored collaboration between Netflix and Studio@Gawker. For more visit netflix.kinja.com.